Oracle recently announced that it had entered into an agreement to acquire FatWire. Immediately there was a lot of discussion as to how this would affect users of Oracle WCM, such as Real Story Group, Bloomthink, Fierce Content Management, and Word of Pie and whether there would be pressure from Oracle for users to migrate from WCM to this newly acquired platform. TEAM is the premier Oracle Gold Partner for Enterprise 2.0 and in particular in the web content management area, so we have a large stake in the successful implementation and support of many different Oracle solutions. Although we have no inside knowledge of Oracle’s plans, we have a lot of experience with Oracle’s acquisition strategy and their broad product and platform integration goals. Its architecture fits well with FMW – as did Stellent at the time of its acquisition 5 years ago. 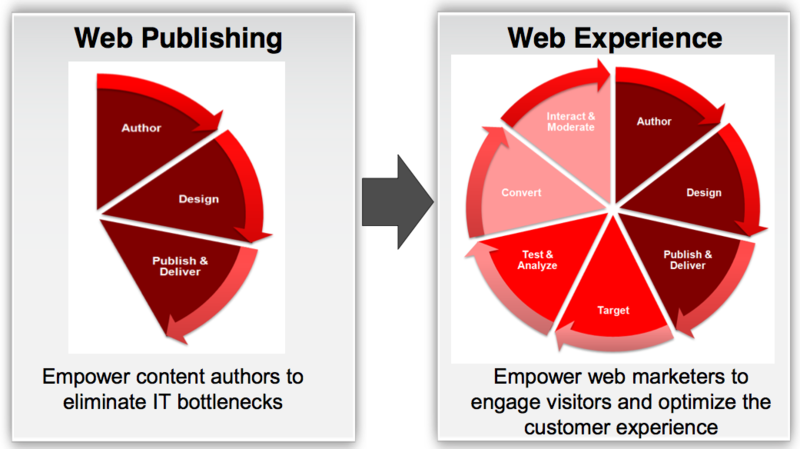 We’ll explore the FatWire architecture in another post, but we did want to expand on the notion of Web Experience Management, because until we saw the following diagram we thought it was just a marketing buzz term. This is really the reason why we believe that FatWire will complement rather than replace WCM and Site Studio – the value that FatWire brings to the table is the additional targeting and collaborative capabilities, which were missing from WCM. It’s likely that the presentation and design tools of FatWire and WCM will be combined and enhanced and that new capabilities will be added whenever the first fully integrated release happens. In the meantime, Oracle has announced the WebCenter strategy to include all WebCenter, FatWire and UCM.